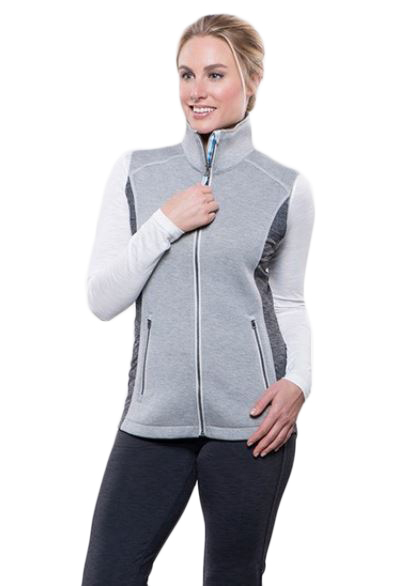 """The KUHL W'S KESTREL VEST features 3D double knit fabric for lightweight warmth. stretch knit fabric on the side panels allows greater freedom of movement and creates a slim look. Tested to more than 10K pulls, the YKK Metaluxe center front and pocket zippers look like metal at one-third the weight. Custom KUHL reflective ribbon at the inside draft flap and pockets provides better nighttime visibility. The W'S KESTREL VEST features stylish coverstitch and raw-edge details. Center front zipper length falls to hip (26"""").